Walking in Milan between fashion week & shopping – KIMOMO Lab. The fashion week calendar starts always on September 22nd, and until September 28th the city is full of artists, events, catwalks. People from everywhere are present, and they suggest so many interesting inspirations and ideas: from catwalk to street fashion, trends coexist and create themselves in the air, moment by moment, all around you! Creativity has no limits, is immediate and everyone could be the maker or user, this is the fun of these past days of full immersion in this environment! Cristiano Burani catwalk’s entrance. She combines a denim dress upon the tapestry outerwear with geometric and folk pattern and open toe mary janes with simil-amber heel. Spectacular! Socks are indispensable and so cool at the moment. The tattoo makes the outfit stronger and gives a post punk touch. the girl with blue sky fur on the shoulder looks like a little fifties diva, a little cartoon mood. The shoes give a more serious touch and the minimal black top makes the outfit less blatant. The photographer in dark trench and matching bag appears so urban chic! She wears also a wide like-wheel skirt, Oxford shoes with socks in contrast; the camera shoulder belt makes herlook brisker… was it a precise choice or random? The third woman choose an elegant evening look – in broad daylight! – with a long laminated dark gray dress; the emphatic grooves remember Greek-ionic colonnades and Mariano Fortuny’s Delphos tunic. The hat completes the look. The fourth girl is so classy with a vaguely neoclassic hairstyle, but with no braiding. She has chosen a really minimal ochre dress that plays on the volumes like a sac in the upper part, bare shoulder, tight and straight in the bottom part. The chic dress is in contrast with Dr Martens like boots. An interesting mix. We leave Burani and go to another animated area: Prada’s catwalk entrance. It’s curious to note that every fashion designer and brand attract to themselves well-defined fans in style, everybody united by an invisible thread. the fur is definitively basic part of the apparel and accessories : furry loafers, dress with fur attachements, fluorescent pumps with middle heel and totally oxford shoes for guys! everyone is crazy for flats and pumps with lace (in the middle) between fetish and Gothic mood. Finally, padded booties suggest winter holidays with wool and more fur… claiming for the cold season. They are sister by style : high heels,glamour bag, dark bottom with blouse in contrast. Stripes patterns and grunge squares continue to be cool. postman bags at the moment (we have seen them at Burani’s show), often worn with contrasting clothing. In this case (on the right) we have an arm jacket upon a crochet dress.. a new metropolitan mood, new approach and comibnation to apparel. The hat is so near a democratic complement for clothing at the moment. However,so sorry because this so distinguished and good taste element, symbol of high class and beauty with no time is worn only in its trend periods,and the hat fans become outlandish when the fashion use of the hat is finished. This is the funny contradiction of human behaviour; but fashion is what we ourselves create. We change totally environment and breathe an amusing and humorous atmosphere gradually down to kitch: who’s on the Moschino’s catwalk? Evening sandals and suede pumps with jewelry attached are not absent. also sneakers with glitter and paillettes are so trendy at the moment! At Armany’s, winter suggestions (as we have seen before, like fur and wool) are totally absent : sandals and spring-summer shoes win; elegance and street style according and creating new dress-codes. Lively touches and strong hints of colour are present. shock, upon this anthracite grey total look in a really light weight wool. On the left, patent leather sandals vanish from red to port tones, they are so wonderful combined with white cotton trousers. Simply chic 😉 . Through Armani’s fans we’ll see red as prevalent colour. They look like carefully combined twins in style: the same patterned tissue, shorts for one, dress for the other. Black details are perfectly in concordance with total apparel -the clutch with “leaf” shoulder belt is fantastic! – also the copper hair absolutely exalts the outfit. Patterns and prints are various. Beginning from the Japanese in green flower dress; follows the retro girl with wide grey wool skirt, big flower applied and bouclé jacket with geometric effect. The handbag is in concordance with shoes and also vintage is the hairstyle. It’s so original the damask coat, so cool in this season, in red tones upon the striped skirt with flat shoes. In this selection you can see fancy dresses and strong colours and prints: floral or geometric,shorts and aflutter dress, so expressionist. High heels and ponytail. Different lines: little black dress with unusual neck, cloche an sixties mood for the yellow one with shoes in tone. 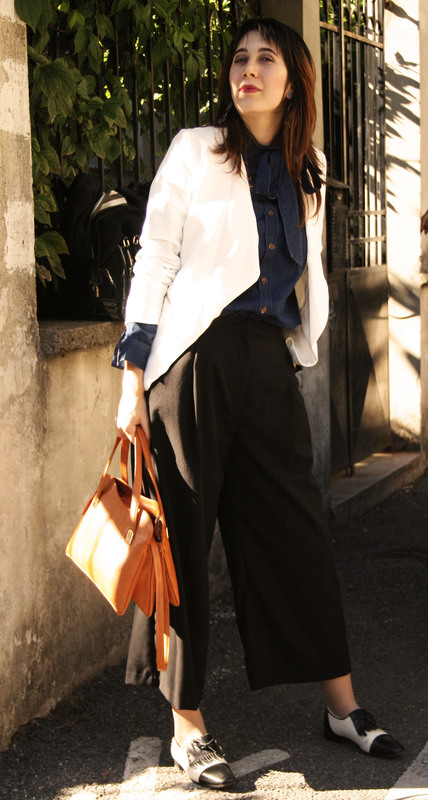 The blue “book” bag give a particular and strong touch to this bon-ton outfit. Catwalk is ended. Everybody runaway: a stronger look selection. White lace suit , denim washed jacket, clutch and motorcycle helmet: a really beautiful contrast. Little black dress with rainbow jewellery, shoulder bag and shoes with a manly touch. High boots are so trendy at the moment, here in a bad combination with the dress… a free irregular choice. Just a look at this total red outfit which creates a great effect, very elegant and light and flow in the meantime. Pants, shirt and handbag completed by a bouclé jacket bi coloured (blue-red) and so chic dark red maryjanes. My fashion trip ends with this short monitor, full of reflection about what circulates in the fashion world, what is proposed, what people wear, and why… feel free to get your conclusions and opinions. What impressed you most? while everybody reads and talks about fashion weeks, I think is more interesting to analise what kind of people go to this events, and what do they wear. And why. Because we are the public and the users. And everything starts from us. See you soon on next trip. Oh you are very kind! 🙂 I’m glad that u like our post!